Michael Dubruiel: Yes, We Can! techniques, police Cmdr. Louis Gray Jr. said. 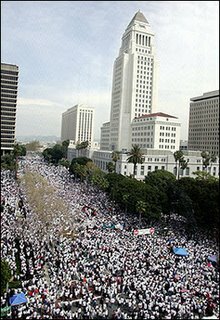 symbolize peace, the demonstrators chanted "Mexico!" "USA!" and "Si se puede,"
an old Mexican-American civil rights shout that means "Yes, we can." have become a lawless nation.